The Big Idea: Pictures are great tools to help children label and manage big feelings. Sad, worried, mad—adults and kids alike are likely to have big feelings while coping with divorce or separation. These emotions can be overwhelming, and children may not have words to describe them. A feelings chart helps children name and better manage these feelings. Discuss each feeling on the chart. Ask, “Do you sometimes feel sad?” and “What makes you feel sad?” Assure kids that it’s normal to feel different emotions at the same time. Ask children if they can think of any feelings that are not on the chart, like worried or nervous. They can draw these additional feelings on the blank squares. 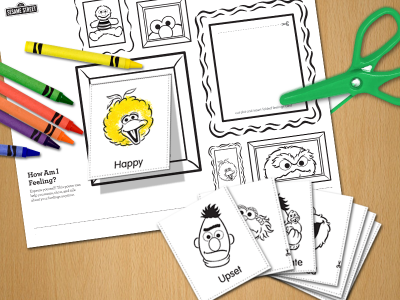 Help kids color and cut out the feeling cards one by one. Cut along the dotted lines on the poster to make pockets. Help children think of activities to do when feeling each emotion. Write those ideas on the back of each card. Ask, “What helps you when you’re sad?” You can suggest activities by saying something like, “When I’m sad, it makes me feel better to dance.” This gives children new ideas and shows them that adults also need to find ways to manage feelings. Hang the poster where kids can see it. When they have a big feeling, ask them to find the card that matches it and tuck it into a pocket. They can turn the card over for an activity that might help (over time, you can add to, change, or get rid of strategies that don’t seem to work anymore).